Creatine Monohydrate, Vegetarian Formula, 2.2 lbs. NOW Creatine Monohydrate, Vegetarian Formula, 2.2 lbs. Creatine Monohydrate is a naturally occurring compound found in the human body and obtained in the diet primarily from meat and fish. Creatine is a popular supplement among active individuals because of its ability to serve as an energy reservoir, especially during intense physical exertion. During short, intense bursts of activity, the body breaks down adenosine triphosphate (ATP) into adenosine diphosphate (ADP) and phosphate for energy. Creatine helps the body convert ADP back to ATP, providing greater amounts of ATP for energy, which may increase short-term endurance and strength. Creatine can also be stored for later use by cells, creating the "energy reservoir" active individuals desire. 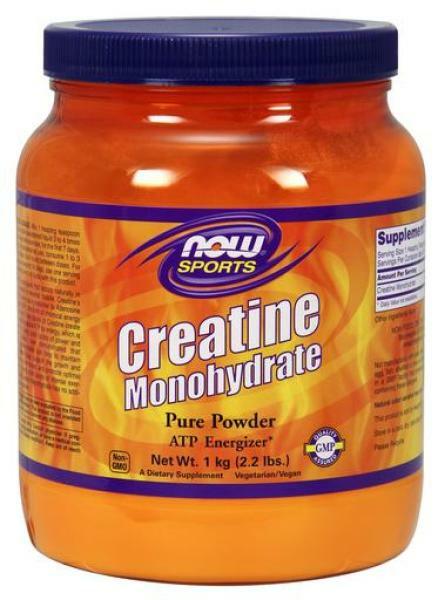 * NOW® Creatine Monohydrate is 100% pure and contains no additives or preservatives. Suggested Usage: As a dietary supplement, mix 1 heaping teaspoon in fruit juice or other sweetened liquid 3 to 4 times daily, before and after exercise, for the first 7 days. Thereafter, for maintenance use, consume 1 to 3 times daily. Allow 3 to 4 hours between doses. For continuous use beyond 28 days, use one serving daily. Consider taking this product in combination with NOW® Pyruvate, D-Ribose and Carbo Gain. Disclaimers: *These statements have not been evaluated by the FDA. This product is not intended to diagnose, treat, cure or prevent any disease. Natural color variations may occur in this product. Creatine may be especially useful for those doing short-term, intense exercise, such as weight lifting, football, basketball, swimming, skiing and cycling.